May evenings start with Venus very low and virtually invisible in the west after sunset. Jupiter is above it and right of Orion. The bright star Sirius is in the southwest for northern hemisphere viewers, further to the north for people viewing farther from the south. Saturn is below and right of the bright star Arcturus in the east. Venus climbs higher into the sky each night. But for those north of the equator, the later sunrise each day doesn’t help make Venus much more easily visible. The moon passes the planet on the 10th and Jupiter the next two nights. The last ten evenings of May provide for a dance among three planets as Venus draws close to Jupiter and Mercury joins them from below. On the 26th, they’ll form a triangle. On the 31st, they’ll be in a straight line with Mercury on top, Venus in the middle, and Jupiter below. For what little we’re able to see Mercury this month, it’s having an interesting May. It’s in conjunction with Mars on the 8th and with the sun on the 11th. On the 16th, it’s in perihelion, its closest to the sun in its orbit. The moon passes the star Regulus on the 18th. For some viewers, it will pass right in front of the star Spica on the 22nd. Southeast Asia, Micronesia, and many south Pacific island will provide good views. Then, the moon passes Saturn on the 23rd and Antares on the 25th. 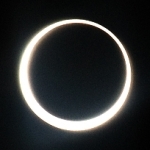 An annular eclipse of the sun occurs on the 10th. The moon will pass in front of the sun. However, the moon will be too far from Earth to completely block the sun. Instead, along a path that stretches across the northern provinces of Australia and much of the south Pacific, the sun will form a ring around the moon’s disk. Other parts of the globe hundreds of miles on either side of this path of annularity will see a partial solar eclipse. A penumbral lunar eclipse happens on the 25th. This is when part of the moon passes through the penumbra, the outer part of Earth’s shadow. In this eclipse, the moon will barely touch the penumbra. The entire eclipse will last barely a half hour. If you’re a very keen observer, you may be able to see the southernmost part of the moon’s disk darken slightly. You’ll need to be in the Americas, far western Europe, western Africa, or some ocean locations in the Atlantic and Pacific. See this eclipse if you can, for it will be special. It’s the first in a series of related eclipses that will happen over the next 1,262 years! Its 70 siblings will include deeper penumbral, partial, and total eclipses through the year 3275. Try your luck at seeing a few Eta Aquarid meteors on the mornings on and around the 6th. As Earth passes through an old dust trail left by Halley’s Comet, you could see a meteor every minute or so. Moonlight won’t spoil the view for this one. But light pollution could. Choose a location with a very dark sky if you can.